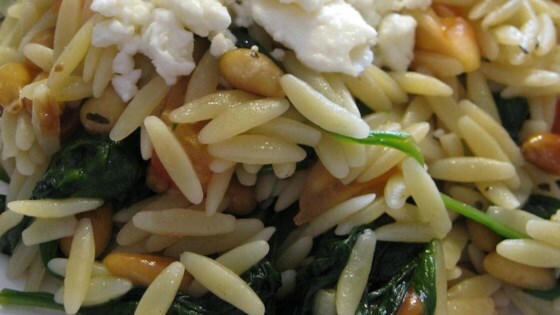 "Orzo pasta with wilted spinach, feta cheese, tomatoes, and balsamic vinegar - goes well with fish or chicken." Bring a large pot of lightly salted water to a boil. Add pasta and cook for 8 to 10 minutes. (Firm or slightly undercooked orzo works best for this dish.) Drain, transfer to a mixing bowl, and set aside. Heat olive oil and butter in a large skillet over medium high heat, stirring to blend. Stir in garlic, basil, and red pepper flakes, and reduce heat to medium. Stir in pine nuts and cook until lightly browned. Add spinach, cover, and cook on low heat for 5 minutes, or until spinach is wilted. Toss spinach mixture with orzo pasta. Portion onto serving plates with a drizzle of balsamic vinegar and a sprinkling of crumbled feta cheese and chopped tomatoes. Allow guests to adjust seasoning with salt, as needed. Enjoy! I've made this about six times now and I find myself looking forward to it each time. Other reviewers are correct, don't skimp on the spinach and cut the oil. Great for a summer side dish. This recipe was great! Only additions were capers, sundried tomatoes and black olives! YUM!